In the never-ending quest for fulfilment, we sometimes convince ourselves that life would be better if we just had a different career…more education…a new spouse…a fresh start in another location. The good life is always just out of reach. Do you want to know the secret to living the good life—a life of meaning and satisfaction? The wisest man in the ancient world searched for fulfilment by experiencing everything the world had to offer. 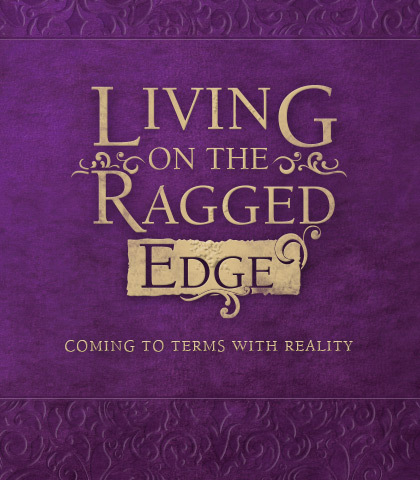 In Living on the Ragged Edge: Coming to Terms with Reality, Chuck Swindoll explores the personal journal of King Solomon, the book of Ecclesiastes. If you struggle to find contentment and joy in life, then join Chuck as he shares wisdom for living at its best. While we are always on the brink of change, Ecclesiastes 3 draws out two questions that must be addressed. The interlude in Ecclesiastes 3:11-15, though brief, brings into perspective several things Solomon had missed in his search for purpose and direction. In the final paragraph of Chapter 3, Solomon is alone with his thoughts. He admits his disillusionment and confusion. It's lonely at the top. The dream of climbing the ladder to success is more often than not a distress-ridden nightmare. If we take Solomon's counsel to heart, two are better than one, we learn how to survive lonely, desolate days. Ecclesiastes 6 is the tragic picture of a man, old and weary, who has come to the sunset years of his life. Solomon shares wise counsel about certain things being better than others. The verses in Ecclesiastes 7:15-29 help us see the practical usefulness of wisdom and how to fit it into everyday life. In Ecclesiastes 8, wisdom is personified in the life of “the wise man.” These principles can be applied to today's leaders. In this paragraph out of Solomon's journal (Ecclesiastes 8:10-17) we find the wise man, hoping to balance idealism with realism. Have a Blast While You Last! This section of Ecclesiastes, though direct and bold, is very much in tune with life today. Ecclesiastes 9:11-18 is a section of Scripture that invites you to pull out of the rat race and take an honest, studied look at life. In Ecclesiastes 9:11-18, each verse is a maxim, loosely connected to the next, comprising a whole chapter of contrasts: wisdom versus folly. In Ecclesiastes 10:12-20 Solomon goes further into detail, supplying additional information about the characteristics of a fool. Enjoying life is inseparably linked to the life and plan of our Creator. Since all of us will “return to the earth” and since our spirit “will return to God who gave it”, now is the time to remember Him in all our ways. The book of Ecclesiastes ends with the rebel back in the pulpit, now that his heart and soul are above the sun.